People enjoy their privacy and it’s not because they are paranoid. Rather, it is a desire that domestic activity remained intimate and not open to the prying view of public scrutiny. This is why homeowners will invest in building privacy fences to surround the property. This urge to be sheltered from the outside world often results in row on row of rather drab looking planks of wood in need of a paint job. A wooden privacy fence by the way is not a cheap project, nor is it easy to maintain. A very nice alternative and a green one at that is to simply grow your own privacy and security fence. This does require investigating a few landscape options for the wall. The immediate option is to grow hedges. These living fences can be exceptionally beautiful and in some varieties can grow to heights that can block out prying eyes. How good are they for security? The American army was stalled in Normandy by hedgerows that were over eight feet in height. A thief would need a chain saw to cut these bushes. Sharp corners can be a challenge but a way around that would be to use bamboo. Besides growing very quickly, bamboo is a sturdy grass whose foliage can obstruct the view. Something to keep in mind, though, is that bamboo also spreads and precautions have to be taken so that its growth is restricted behind the property lines. 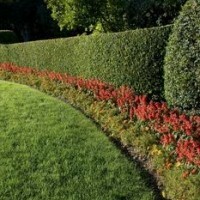 Evergreen shrubs are another option for the natural fence. These can be immense and grow as high as 15 feet or more. Several varieties such as the Irish Juniper have beautiful colors and smaller privacy options like the “Little Red” can be used if tall privacy fences are not what the homeowner has in mind. The environmental benefits of having a natural sense are pretty obvious. In addition to sparing a tree, these sturdy shrubs process carbon dioxide like any other living plant. It’s nice to know that the living fences are ordinarily not restricted by zoning laws, are relatively cheap to establish, and only require pruning for routine maintenance. The natural beauty of some of the flowering shrubs makes these ecological security systems even more appealing. It is still possible that rocky terrain could cause some open spots in the privacy wall. Homeowners can easily overcome that with window film. This is a product that can darken with the sunlight, allowing any person to look outside but preventing nosy neighbors from looking inside. Should a homeowner want to continue the theme of a natural setting, window film is available with flowery patterns and natural designs on them, thus continuing the idea of a connection with the natural world. Privacy is definitely something that people want to have at given times of the day. A natural privacy fence can very easily provide the desired seclusion and at the very same time offer calming visual beauty. It is almost too much for a lover of the natural world to eve r resist.